3rd Platoon A-Company 643rd TD Battalion. 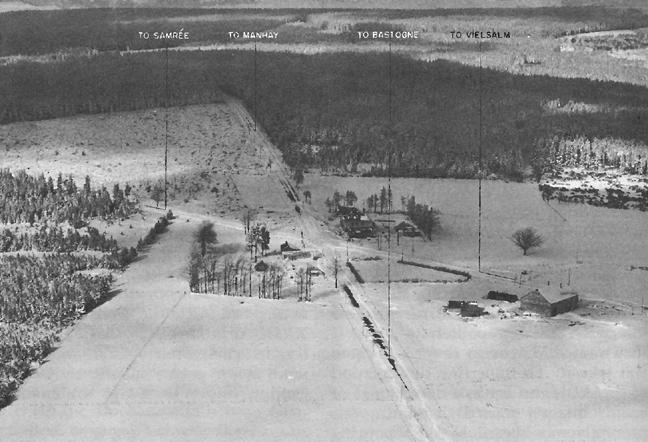 Baraque de Fraiture also know as "Parkers Crossroad"
On 12/22/44 the platoon (Four towed 76 mm guns and their security sections, about 60 men) went into their FIRST COMBAT MISSION at Manhay, Belgium where Battalion Headquarters was located. Direct quotes from Charles B. Macdonald's book A Time for Trumpets on P. 545 and entries from the 643rd Battalion history, the platoon leader, Lt John Orlando, was instructed to go south from Manhay to the Baraque de Fraiture crossroad where he would find Capt. Junior R. Woodruff; commander of Company F, 325th Glider Infantry for orders. Lt Orlando found Capt. Woodruff at his CP (Command Post) at the crossroad. While Lt. Orlando was in Woodruff's CP, a man, Pvt. Ed Kreft was sitting in the halftrack used to tow the 76 mm gun when he saw three men from the 3rd Armored Division walking past their halftrack. Ed recognized one of the men who was from his HOME town, Rogers City, Michigan, named Russell Bye. After greeting each other, Russell asked Ed what they were doing there at the crossroad. Ed told Russell that their platoon leader was in Capt. Woodruff's CP where he was to be told where to set up his four 76 mm guns. Russell said there was nothing but Germans in that area and the three 3rd Armored Infantry men were leaving because they would be unable to keep from being overrun. Lt. Orlando came from Capt. Woodruff's CP after receiving his orders. At this point, I have been told by some of the men of the 3rd Platoon that they set up their guns on roadblocks at the northern edge of Baraque de Fraiture. Other men have told me they continued southward out of Baraque de Fraiture for a distance of possibly as much as two miles. Having talked to one man who told me he was in Baraque de Fraiture when the Germans overran the crossroads, he told me there were no tank destroyers in the crossroads when it was overrun. In the past few years, I have become acquainted with Capt. Woodruff's runner, Pvt Jim Bryant. A runner is a man whose job was to run messages from one officer to another on foot or by any vehicle available to him. These runners were used mainly when it didn't seem wise to use telephone or radio communication or if telephone and radio communication had been knocked out. The runner also told me the only tank destroyer person in the crossroad was Lt. Orlando when the Germans succeded in overrunning it. With these two individuals making the same statement, I have concluded that the men who remembered proceeding southward from the crossroad are correct. As the men set up their roadblock somewhere south of Baraque de Fraiture, they could hear Germans digging in within hearing distance of the tank destroyers who were also digging in. Lt. Orlando told me on more than one occasion while attending reuinions of the 643rd TD Battalion in the 1980s and 1990s that he went back to Capt. Woodruff's CP to request infantry support. Capt. Woodruff told Lt. Orlando he had no infantrymen that he could provide. I haven't talked to any of the survivors who remember hearing that Lt. Orlando told them of Capt. Woodruff''s report that he could not provide infantry suport. The possibility does exist that Lt. Orlando reported it to platoon sergeant,S/Sgt George H Caldwell, and they thought it best that the men would be further concerned if they knew. As you can see, my mention of this possibility only adds more uncertainty to the situation. The gun crews and security section men tried to get some sleep after finishing digging in. In the early morning (reports that men have told me vary about the time) artillery or mortar shells began coming in. Soon German infantry began overrunning the positions of the 76 mm gun emplacements under the command of Sgt Frank Martinelli and Sgt Joseph Giordano. Sgt Giordano was killed and Sgt Martinelli was taken prisoner. Some members of their gun crews were wounded, some taken prisoner, and others were reported MIA (missing in action) after this encounter with the Germans. When the guns under the command of Sgt. Maynard and Sgt. Sienkiewicz (First names unknown to me) heard the men in Sgt Giordano's and Sgt Martinelli's guncrews being taken prisoner, they hooked up their guns and headed northward through Baraque de Fraiture toward Manhay. Cpl. Jim Robinson has told me on many occasions that an unknown officer in Manhay ordered Sgt Maynard's guncrew to set up their gun in a certain location. They did so and soon a different officer told them to set up their gun in a different location. About this time, Sgt Maynard and his gun crew decided to find a location where it might not be as dangerous as the ones they were ordered to occupy by the officers. Maynard's gun crew watched action in Manhay from inside a barn with a view of the action taking place in Manhay the morning of 12/23/44. Sgt. Sienkiewicz told me his guncrew was told to set up their gun in Manhay. When he determined that his gun was in danger of being taken over by the Germans, he destroyed his gun as we were instructed to do when we were in training back here in the U.S.A. Sgt. Sienkiewicz was prosecuted for destroying his gun and transferred into an infantry division where he remained until the war ended.